It’s funny how you can walk by something so often and never notice it, and then one day it just pops right out at you, and you wonder how you’d possibly managed to miss it. Such was the case with me this week. I’ve walked passed these little saplings every time I’ve taken Raven back into the fields behind the house. They stand just off the trail, not too far. I’d even gone over to check one out a couple of months ago, because I’d noticed some galls in the leaves that looked interesting. The leaves came down in October, and for the last month or so I’ve been walking by these bare-naked trees and never noticed anything. Then this week I glanced over and happened to spot a small blob in the lower portion of the tree that I hadn’t noticed before. So I went over for a closer look. It was a nest. How the heck had I missed that all this time? 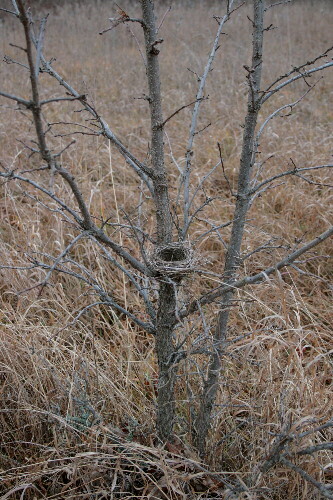 Especially once the leaves come down and nests usually become quite conspicuous. Given its size (closer photo below, with my fingers for scale), structure (a compact cup of mostly grasses), habitat (open fields with widely scattered brush), and location (a couple of feet up in a small oak sapling), I guessed it to be a Field Sparrow nest, probably a late-summer second-brood nesting. In the early summer Field Sparrows usually nest on the ground because that’s where cover is thickest, but if they decide to try for a second brood later in summer those nests are often elevated, since by that time the leaves are all full and green on the shrubs and trees. The only other likely candidate might be Chipping Sparrow, but I tend to think of them as nesting more commonly in conifers, and their nests as being shallower constructions lined with animal hair rather than grasses. I’m always surprised by the nests I see once the leaves are bare. 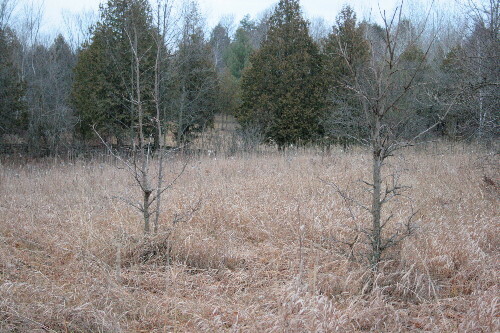 Right where I looked a dozen times during breeding season and saw nothing but the leaves. It’s amazing how well a bulky structure can blend in in the summer! It’s too bad most nests are so hard to identify once their owners have left. I saw an exact looking nest today. 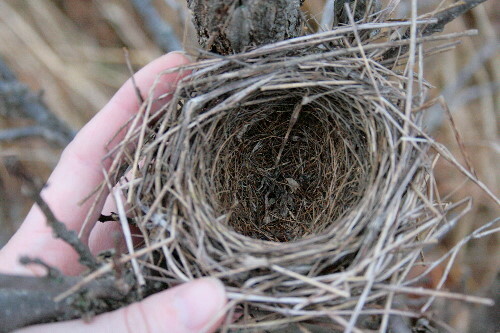 The tree is broke, but the nest is still intact, although empty. Nice write up!